PT Phillip Sekuritas Indonesia is a trusted foreign retail securities broker at Indonesia Stock Exchange (IDX). We are a member of PhillipCapitalGroup, one of the biggest financial institution in Asia that headquartered in Singapore and has global network in 16 countries in the world. Create and develop social media content & advertising content, write/re-write personal financial planning related articles. 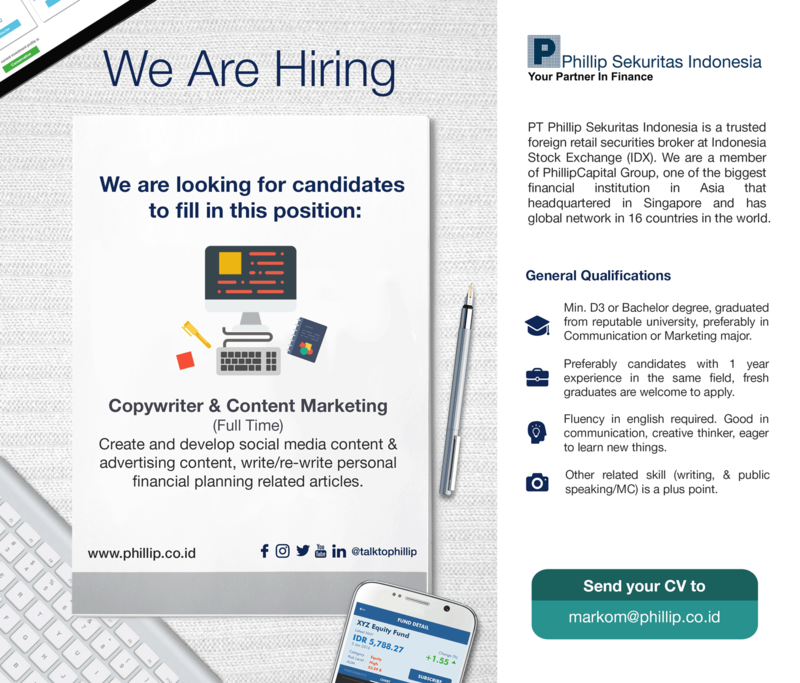 Description PT Phillip Securities Indonesia is a trusted foreign retail securities broker at Indonesia Stock Exchange (IDX). We are a member of PhillipCapital Group, one of the biggest financial institution in Asia that headquartered in Singapore and has global network in 16 countries in the world. PT Phillip Securities Indonesia has been established in Indonesia since 1994, and has been providing financial services products such as stock broker, online mutual fund supermarket, and corporate finance service. We launched POEMS ID (Phillip’s Online Electronic Mart System) to facilitate investors in stock and mutual fund investing, and it could be downloaded on iPhone and Android smartphone. POEMS has been acknowledged as the best online stock trading system in Indonesia, as awarded in Online Trading Terbaik 2015 by Investor magazine and Beritasatu.com.